Miss Nebraska USA Recap: Sarah Rose Summers Crowned! Every now and then in theatre, things go awry, such as power outages during a show. Pageants are no different, especially when the production is being held in a ninety-one-year-old historic theatre building in downtown Omaha, Nebraska at the beautiful Rose Theatre. Sometimes they too, are faced with technical or in this case electrical difficulties. A power outage occurred hours before the Miss Nebraska USA 2018 pageant on Sunday night. Contestants scrambled to get ready despite the mishap and made the best of the situation. 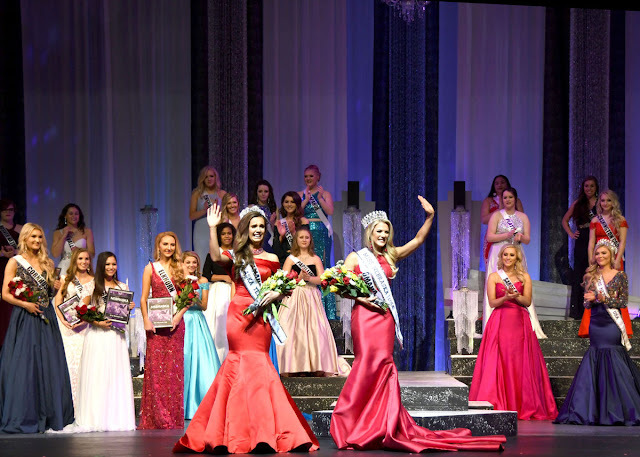 Miss Nebraska USA, the final State pageant to the crown before the Vanbros 2018 class was complete. Only a record seven contestants vied for the prestigious title to go on to compete at Miss USA on FOX, with returning 2016 second runner-up and Miss Nebraska Teen USA 2012 Sarah Rose Summers claiming the title. Even with very few girls competing nonetheless it was a tough competition. There was no announcement of a top 10, another first, as the audience anxiously awaited to see who would make the cut. Instead, all delegates went on to compete in swimsuit, and evening gown minus an intermission before they whittled it down to a final five. On stage question consisted of personality icebreakers and questions written by other contestants. Summers answer alluded to her advocacy of inspiration and motivation on social media, referencing "Mantra Mondays," she likes to post about. The eye-catching blonde wore a stunning red gown with a plunging neckline and floor-length train. First Runner-up was Bree Coffey, who won the interview. Summers won the Swimsuit and Mentorship Awards. Composed, poised, and unabashedly confident, Summers took the title with ease and fulfilled one of her childhood dreams and adult goals- to be crowned Miss Nebraska USA. We are so excited to see what she does with the crown and look forward to following her journey to Miss USA!